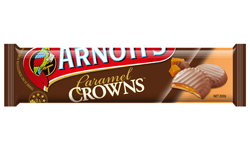 These crunchy biscuits are topped with soft gooey caramel and then covered in Arnott’s real milk chocolate. Each packet contains 12 delicious biscuits. Milk Chocolate (35%) (Sugar, Milk Solids, Cocoa Butter, Cocoa Mass, Palm Oil, Emulsifiers (Soy Lecithin, E476), Flavour), Caramel (30%) (Sugar, Condensed Milk, Glucose, Butter (from Milk), Palm Oil, Emulsifier (Soy Lecithin), Salt, Flavour, Antioxidants (E307b from Soy), Wheat Flour, Sugar, Palm Oil (Contains Soy), Malt Extract (from Barley), Cocoa Powder, Baking Powder, Salt, Emulsifier (Soy Lecithin), Flavour. Got it today, and munch it now I write this review. I love the chocolate, it really reminds me of the nice Tim Tams, I love Arnotts chocolate, the cookies are not really big, but for the size of the cookie it really got some flavour in it! the nice cookie(or biscuit) and a thing goo caramel, its fantastic! the chocolate on top make this cookie really nice, the name is true in all words :) it deserve a crown for sweetness!